I completed the first aileron. A set of rivets needs to be driven to attach the bottom skin to the spar. You start by clecoing the skin and then checking to make sure the D-box formed by the nose skin and spar does not have a twist. I had to take out about a 2 degree twist by manual manipulation before I started riveting. I had a hard time reaching between the upper and lower skins to hold a bucking bar. 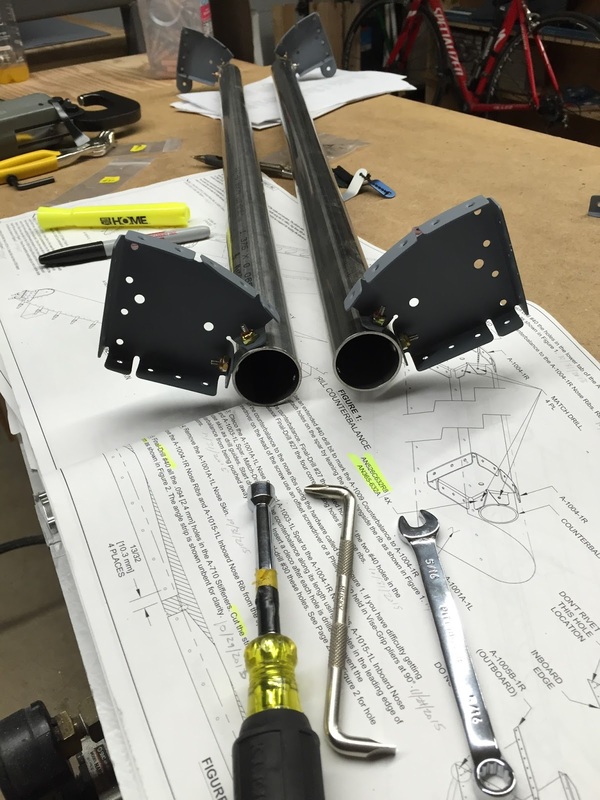 Luckily, I was able to reach the majority of the rivets with the special bucking bar I used on the elevators. I used the flat side of the bucking bar and leveraged it up from the edge of the table. I set a couple widely spaced rivets and checked for twist before proceeding. Everything stayed within a few tenths of a degree according to my iPhone running a bubble balance app with digital readout. Pulling the rivets in the end ribs and nose skin to counter weight tube were the easiest part of the job today. 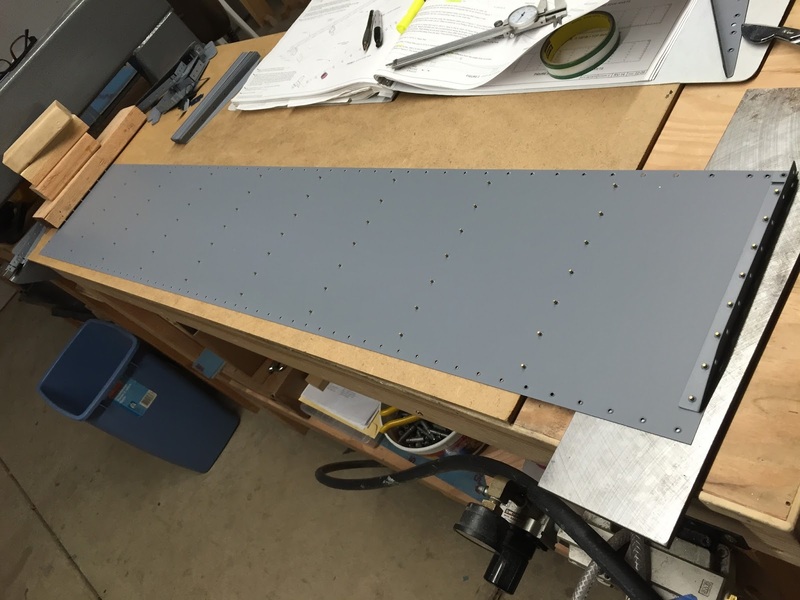 I used the 2" x 2" aluminum angle I made for the rudder to hold the trailing edge. 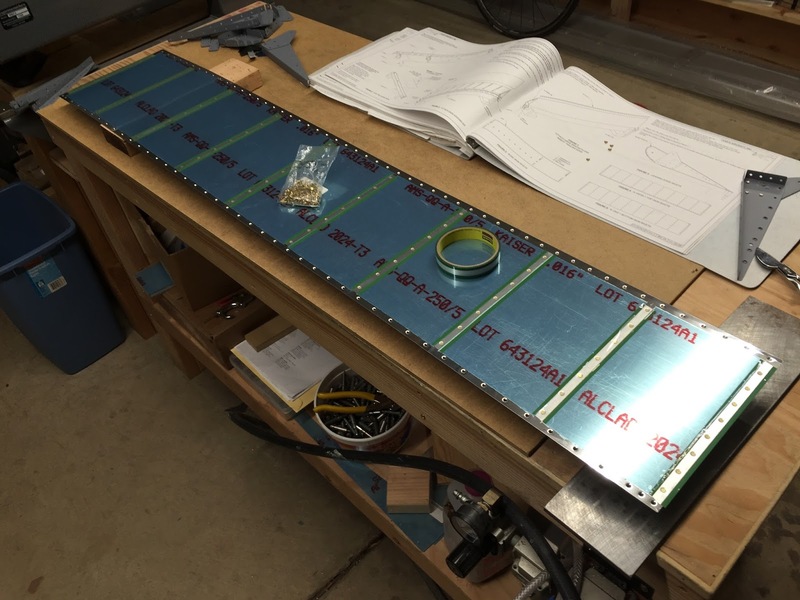 I also held the aileron flat on the table while setting the double flush rivets in the trailing edge. I partially set the rivets using my squeezer and then carefully finished setting the rivets using the back rivet plate and rivet gun with a flat set. I set the air pressure down to 40psi and used short bursts. I could tell the rivet was set by watching the reflection off the aluminum skin. When the reflection and the flat set met (no gap between edge of flat set and the skin) I knew the rivet was flush. You have to be very careful to hold the rivet gun exactly perpendicular to the skin and not over drive the rivet. The edge came out looking great! The riveting today was a little more challenging. You have to take care with the nose ribs not to deform the curved top of the skin. The plans advise pulled rivets for the 2 holes on the tip of the nose where the largest curvature is. 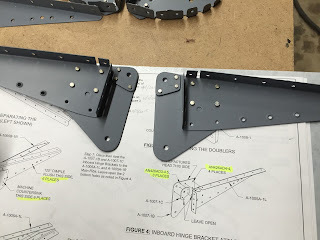 I was able to use the squeezer for the 5 rivets on the flat bottom of the ribs. The spar and top skin get attached next. The skin tends to wrinkle when it is clecoed to the spar so I attached the trailing edge side of the skin to my 2" x 2" aluminum angle trailing edge guide to keep it flat while riveting to the spar. 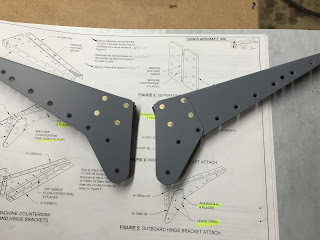 I back riveted the aileron skin stiffeners (ribs) today. Back riveting is an easy task- there's just a lot of rivets in these parts. 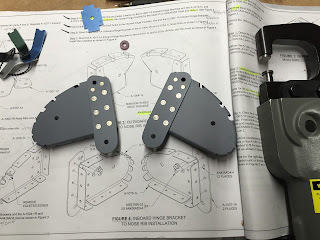 Each skin has 10 stiffeners, each stiffener has 7 rivets = 4 * 10 * 7 = 280 rivets. About a minute and a half per rivet to insert in hole, tape, shoot, inspect. The weather turned rainy and cold so I decided to do some riveting in the warmth of the garage today. 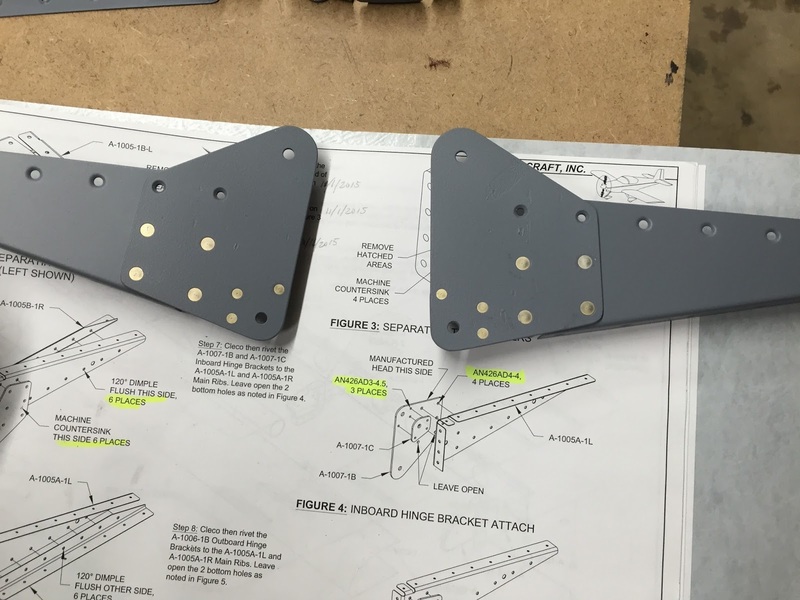 I started with the small aileron parts. I was able to reach all the rivets with the squeezer today. 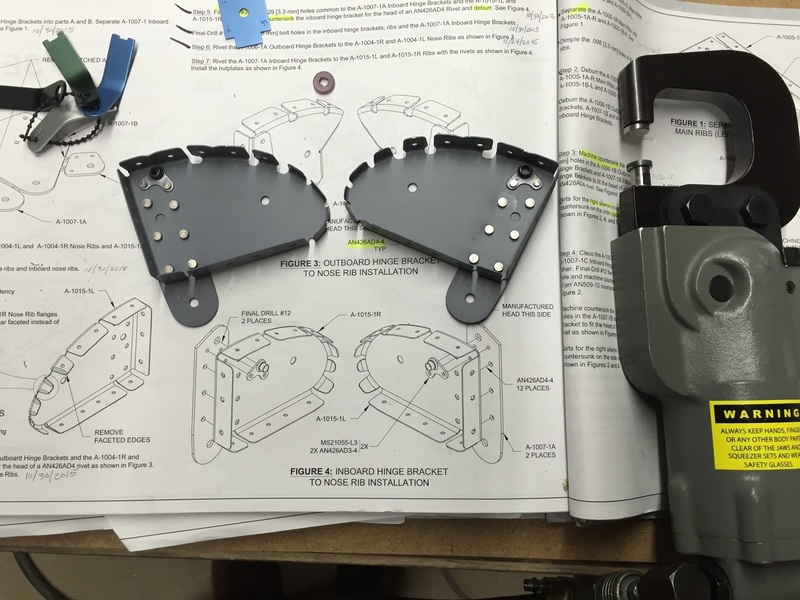 It's always satisfying to see the pieces go together after all the hours of filing, polishing, drilling, counter sinking, dimpling and priming. All these parts come in a left and right configuration so you have to pay attention while assembling. I didn't put in enough clecos before starting the riveting on one of these and it warped after a couple rivets. 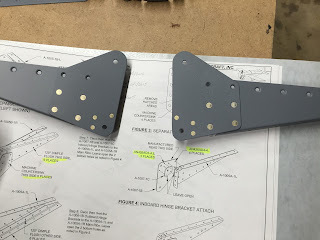 The doubler/hinge point material is much thicker than the rib but the shop head is on the rib side due to the countersinking so the rib wants to warp when you squeeze the rivet. I drilled out the last rivet, flattened the rib in the dimpler with flush dies and then added more clecos before finishing the rivets. It might have been better to start with the AD3 nut plate rivets at the top and then do the heavier AD4 rivets. 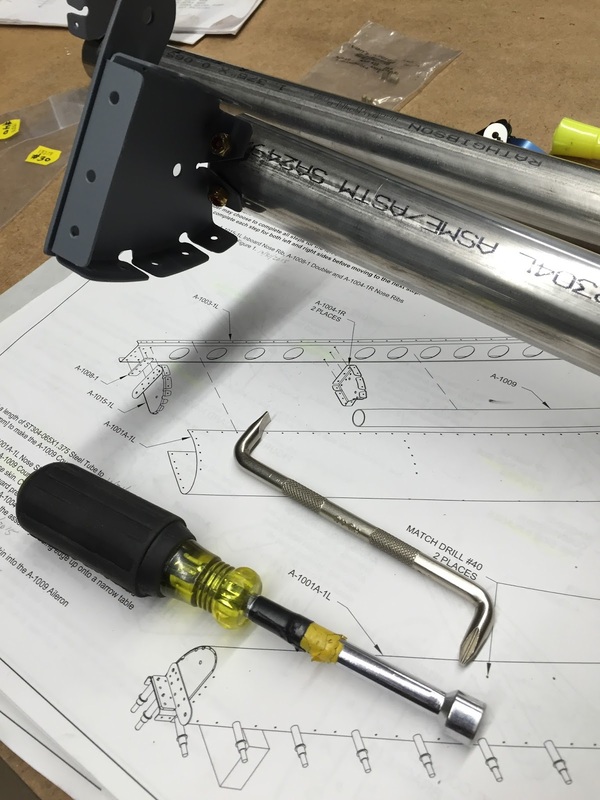 After cross referencing with the packing list I found the hardware for attaching the ribs to the stainless steel tubing counter weights. It is a little tricky tightening down this hardware- I found a right angle philips head in my tool kit which saved the day. I left the screws a little loose. I plan to torque them down after attaching the ribs to the spar to make sure everything aligns properly. I leave the blue protective covering on the skins until either I prime or rivet. I leave it on for dimpling which eliminates the scratching problem from moving the skins around the dimpling die. Stripping the blue plastic protective coating from the rivet lines always takes longer than I think it should. I'm going to have to find a hotter soldering iron so I can move faster. All the aileron skins are ready to flush rivet the ribs. I loaded up the first skin with rivets and taped them down with rivet tape. I'm all ready to pound out a serious number of rivets next building session. These skins take AD3-3's which are the smallest rivets I've used so far in the construction. The empennage skins used AD3-3.5's. I spent the afternoon getting the outboard leading edge skins, ribs and stiffeners ready for priming. I deburred holes and dimpled the skins and stiffeners. I used the Cleveland C-Frame to dimple the holes close to the nose of the skins because the DRDT-2 dimpler would not fit. It was a lot of dimpling, but I paced myself and stayed on task - no extra holes were punched by accident today. I assembled the left and right outboard wing leading edge sections in the cradles, clecoed the ribs in place, cut the stiffener to length and match drilled it to the wing skins. I also match drilled holes in the inboard flange tab of the ribs to match the skins. 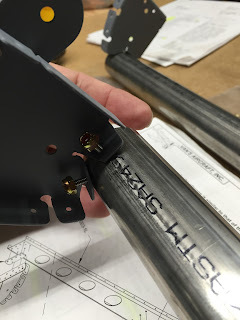 I used my micrometer to scribe a line 5/16" (0.3125") from the edge of the stiffener to aid in alignment in the wing. The scribe line does not cut into the aluminum, only the plastic protective sheet. Here's my onsite inspector, Woodie, doing inspection and quality control. I also cut the slot for the stall warning vane. The dremel cutoff wheel worked well. I continued adding build log entries today and I'm almost caught up. I'm still refining the format of the site and I need to go back and proof read everything, but I can do that in the future when I have project downtime (or would just rather be sitting at the computer ;-). LOL- I added so many entries in the last 2 days that the Blogger software started accusing me of being a robot! I had to fill in Captcha challenges multiple times to add the last couple posts today. 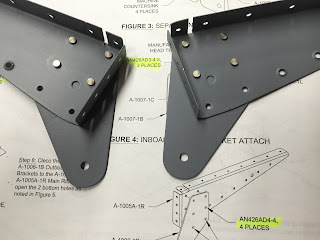 I separated the connector strip from the wing tank skins using the cutoff wheel on my Dremel tool. I then filed and polished the edges of the 4 wing leading edge skins. The landing light ports were fairly jagged but cleaned up nicely with the die grinder / scotch brite wheel. Gas cap hole polished and deburred. Landing light port smoothed and polished. Tank connector strips cleaned up, final drilled and dimpled for #8 screws. Left LE wing skin mounted in cradles ready for next step.